Makerspaces, STEAM labs and fab labs are popping up in schools across the country. Makerspaces provide hands-on, creative ways to encourage students to design, experiment, build and invent as they deeply engage in science, engineering and tinkering. Designing a space to accommodate such a wide range of activities is a challenging process. Educators and administrators can help guide the process and generate the space that works best by researching, brainstorming and clearly articulating their needs, while keeping in mind inevitable changes in the future. 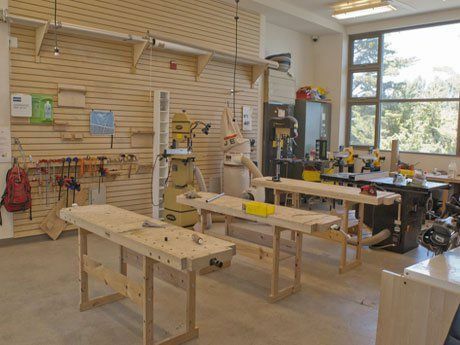 Some schools have chosen to incorporate makerspaces within multiple classroom spaces. This works well for many activities, particularly in elementary schools. As maker activities expand to require more tools, it makes more sense to create a dedicated makerspace that includes appropriate tools, work areas and materials. The following design approach focuses on creating dedicated makerspaces and STEAM labs. WHAT range of "subjects" will be taught in the space? What types of activities and projects could be done there? Determine the needs and desires of all teachers in the school who will or could possibly use the space. Imagine what projects they might initiate with their students. Ideally a science, math, technology and/or art teacher would lead or participate in the brainstorming. The Makerspace Playbook is a helpful guide to envisioning the projects and activities that could happen in the makerspace. The new book Invent to Learn is a great resource for making, tinkering and engineering project ideas. The main point here is to clarify the types of activities that the space would ideally accommodate. WHICH tools are most needed? Will digital fabrication tools such as CNC routers, laser cutters or 3D printers be included? Which materials will be used? The Makerspace Playbook and Makerspace's Tools & Materials PDF document are both very useful tools for addressing these questions. They provide detailed lists of the diverse tools and materials that you might consider. Many types of equipment have special requirements, including ventilation and other elements to ensure a safe working environment. 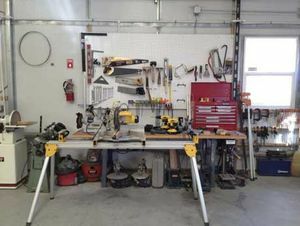 The list of tools and materials will naturally grow as specific projects and programs generate new needs, so it's good to allow for flexibility and expansion. Depending on the projects and activities, the space required for materials and project storage can be significant. WHO are the kids that will be using the space? Will others use the space as well? Who is staffing and managing the space? Having a space that is functional for a range of ages is key in school settings. Additionally, the space might be used for maker activities outside of class time, such as clubs (like Young Makers groups) or parent groups, as makerspaces grow into popular community hubs. At some point, the school may hire a part- or fulltime makerspace teacher. In fact, some see this as critical from the outset. Students will use the space during the school day, perhaps in a dedicated class time or with their teacher. Other opportunities may arise to maximize utility of the space after school or evenings and weekends. In this case, the design would need to accommodate access outside of school hours and for multiple users. WHERE in the school or on the campus would be ideal? What considerations are important? To accommodate the need for access to materials and tools, it's useful for the space to be easily accessible by cars and trucks, ideally during school day. A location close to or including outdoor work areas allows for larger or messier projects. Access to plumbing and electricity are critical. The space should be located where noise won't disturb classroom learning. Given the need for flexibility, it's good to find a place where the space could expand in the future. Finally, the makerspace would be centrally located so that it can be accessible to students, and visible so that work can be seen. HOW will it be built? Is a new or separate structure needed, and if so what type? What is the budget? Will the design and construction team be a combination of contractor and volunteers, all-volunteer or fully contracted? If you're lucky, there is a large space, classroom or portable just waiting for a new use, and building out the interior will be the main project. If space is at a premium, however, a new structure, portable or shipping container could potentially provide the space or some portion of it. Knowing your budget range will help determine the best way to proceed and whether you'll be able to employ contractors or need volunteers for some of the work. Answering these questions will allow schools to create a "design program" for their makerspace, defining the specific needs and requirements. 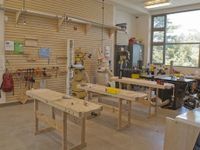 Because makerspaces and the activities they accommodate can vary so much, the design program is one of the most critical steps in ensuring the space will be functional and well used. The school could work with designers or architects to articulate the best ways of meeting those needs. 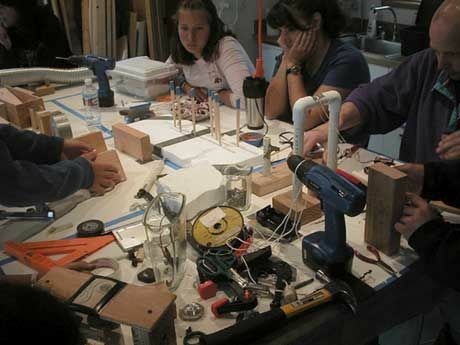 Visits to other makerspaces or labs can be valuable and insightful during this phase, as educators envision what their space could be. A subsequent blog post will provide more information about design patterns typically found in makerspaces.